You may enrol in almost any of the units (subjects) offered at Monash Malaysia if you have the required academic background and have satisfied the pre-requisites of the units. Our courses are accredited by the professional bodies in Malaysia and Australia, for example, our psychology units are recognised by the Australian Psychology Accreditation Council (APAC). Our accounting units are accredited by the Malaysian Institute of Certified Public Accountants, the Association of Certified Chartered Accountants (ACCA) and including professional associations in Australia. We encourage you to undertake multidisciplinary studies by selecting units across different study areas that fit your academic progression at your home university. A wide selection of units offered by seven of our outstanding schools is available for your selection. For example, if you are studying the Bachelor of Science, you may wish to select units in journalism or if you are a Bachelor of Arts student, you may be interested to understand business analytics. Similarly, an Engineering student may want to learn about the cultural and social intricacies within South East Asia. These opportunities are available at Monash Malaysia. At Monash, each campus has its unique strengths and localised unit offerings for example, the Monash Parkville campus is known for pharmacy studies. However, not all the units are offered at every campus, therefore students are advised to confirm with the campuses on the availability of the specific units which they are interested. Popular areas of study at the Malaysia campus among our exchange and study abroad students are within the fields of Business, Arts and Social Sciences as well as Science. We encourage you to consider the localised units within these key areas as they will offer you the opportunity to understand the various issues and perspectives particular to the Asian region. Complete your study abroad experience by sampling the extensive variety of local food, witnessing local architecture in our historical towns and learning the basics of the local language, Bahasa Malaysia. The Intercultural Enrichment Program is a non-credit earning four-week course conducted outside your academic program which introduces you to the multi-facets of Malaysia. Classes and field trips are conducted for a greater experience. Impress your friends with your basic communication skills in the local language, Bahasa Malaysia, when you complete the non-credit earning Malay Language course held on-campus. The course runs for a full semester and you may sign up during orientation. Please refer to more details on General Studies (Communicative Malay 2) as the unit may not be offered every semester. If you are applying to study second or third year units, you must demonstrate that you have successfully completed the prerequisites as detailed in the Monash handbook. If you are applying to study accounting, finance, economics, econometrics and statistics units you must provide evidence of completion of high level Mathematics (final year secondary or tertiary level). Your detailed curriculum and results of your completed Maths units should be attached to your Monash Abroad application for assessment by the faculty. If you are applying to study second and third year units, you must show you have completed the prerequisites as detailed in the Monash handbook(s). You cannot request to study a unit of the same year level and content as an already completed unit listed on your academic transcript – this will not be approved by the faculty. MBA units cannot be taken by exchange or study abroad students. Bachelor of Medicine and Bachelor of Surgery units are not available to exchange and study abroad students. Psychology units are only available to students with substantial previous study in psychology, and the Discipline of Psychology has strict requirements for progression at the undergraduate level. In order to assess applications from exchange and study abroad students, the School of Psychology requires official unit /subject descriptions for all previously studied psychology units – including the number of hours of classes per week, the assessment requirements of the units, the textbooks used and an outline of the content. Approval for 1st year units is fairly straightforward. If you are applying for 2nd or 3rd year units you must have a working knowledge of statistics programs such as the SPSS and have previously written scientific lab reports. You should attach evidence that you meet the requirements mentioned above to your application. You can only apply for 1st year pharmacy units unless you are studying a Bachelor of Pharmacy or a Bachelor of Science (Pharmaceutical science) degree at your home university. Detailed unit syllabuses including the number of hours of classes per week, the assessment requirements of the units, the textbooks used, and an outline of the content should be attached to your Monash Abroad application for assessment. The Monash Course Finder is a useful online database of every degree offered at Monash and a great tool for searching keyword terms to navigate individual unit details. Please note that the fee and application information in the Monash Course Finder do not apply to exchange and study abroad students. Please contact the Monash Abroad office for detailed unit guides for assessment by your home institution. As an exchange or study abroad student under the Malaysian Student Pass rules, you must be enrolled full-time throughout your stay. A normal full-time load at Monash is 24 credit points (four units/subjects) but 18 credit points (three units/subjects) is permitted. You cannot enrol in more than 24 credit points per semester. How many hours will I be doing? All faculties and schools at all Monash campuses use a common grading scale for undergraduate and postgraduate coursework units. When you complete your studies at Monash, you will receive an official Monash transcript that will display the grades you have earned in each unit. The Monash grading policy gives you more detailed information about grade conversions, although your home university might convert grades using a different measure. Monash may use different terminologies from your home institutions. Understanding these terms will help you complete your study plan. For example “course” in your country may refer to a single unit but “course” at Monash refers to a degree or program (for example, the Bachelor of Arts course). Read our complete list of Monash terminology. Click here to download our latest brochure! MUM.MonashAbroad@monash.edu and our Monash Abroad coordinators, Feny Wong(feny.wong@monash.edu) and Tiong Hui Jin (Tiong.HuiJin@monash.edu). 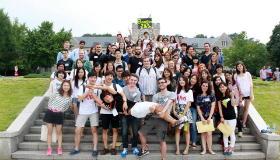 Here is what some of our students have to say about their Monash Abroad experience.